From Today's Walkabout - Ramblings of Mad Shutterbug & the Border Collie Bros. In case you are wondering, those are Asian Water Buffalo. Our other neighbor, Doc P, he raises them. We gave them a wide berth, and still kept an eye on them because they mostly consider fences as suggestions. Sometimes as not particularly important suggestions. You 're going to need a bigger gun. Once, long ago in a galaxy far, far away, I knew someone (not a friend, a ... co-worker ... ) who attempted to take one down using an M-16. He learned the truth of your words. .308 is as small as I would go, and honestly, an Ma Deuce would not be considered overkill. There are not creatures to be taken lightly or easily. Shooting one with an M16 ought to be considered a suicide attempt. There is a reason buffalo is one of the big 5 in Africa. 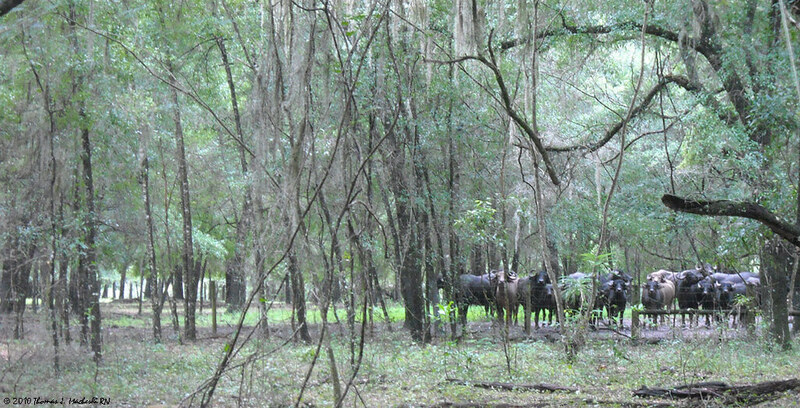 I've heard a pissed-off water buffalo will commence hunting the human who was foolish enough to provoke it. Mmmmm... not gonna even look at one cross-wise, me. I don't think it consisted of 'hunting' the individual mentioned above; certainly the water buffalo in question felt quite annoyed by them and came over to tell them to stop. Said individual then retreated to the top of an armoured personnel carrier, with enough height to be above and enough mass the water buffalo couldn't tip it over to get at them. Unfortunately for both the water buffalo and the family it belonged to, it was sufficiently injured by the 'smaller caliber' weapon that it needed to be killed, and the also afore-mentioned Ma-Deuce (Browning 50 caliber heavy machine gun) employed to do so, with a single shot. Unfortunately (but not regrettably) for the Mighty Hunter, there were also local regulations in place against unnecessarily dispatching the livestock of locals, specifically mentioning water buffalo (since they are used to help cultivate rice fields and such). Amongst other things such as reduction in pay grade and confinement, he was also fined the replacement expense of a water buffalo for the family. There's a really impressive scene in a nature show of a water buffalo taking on ELEPHANTS to save her calf. I wouldn't mess with them. Wow those are beautiful. And apparently scary (?) and probably quite tasty.